Both Deauville and Honfleur are fishing villages, and the fishing boats were moored at the quayside while we were there. Each mooring seemed to have associated with it some fishing gear, going rusty. I don't know why, but I like rust shades, so here's some rusty pictures. There is a quayside market at Deauville: they sell all sorts of things, but there is a special assortment of fresh seafood, as you would imagine. I like the casual art formed by the layout of the products for sale. Here's a few pictures of some vegetables, that I prefer to ones of dead fish. We spent a couple of days on a spontaneous break on the coast at Deauville (touristy) and Honfleur (quaint and very touristy). Great seafood restaurants, sea-front markets, and, being early in the season, not too busy. You can start the day with a nice slow coffee by the harbour, and pick your way slowly round the shops, whiling away the time before a lunch of fresh fish. A beer in the afternoon whilst reading your latest BD. And so through the day. If you have any musical interest at all, you must visit the museum of Erik Satie in Honfleur. It takes about an hour to go round and it aims to be as quirky and irreverent as the man himself. It is very well done. Spring seems to be well under way, and quite a bit earlier than usual. Some of the flowers are out already and buds are appearing everywhere. But nothing quite does it for me like daffodils. Plain, ordinary, light and dark yellow daffs. Can't beat 'em. But the Wisteria buds are full of promise and the waxy, red-edged leaves of the roses are a delight in themselves. And the Hellebores are out too. While I was at university, before the era of computer games, I spent quite a lot of time playing Dungeons and Dragons with friends. You would assume a virtual character and wander around a virtual countryside, encountering and dealing with various hazards as you went. There are plenty of computer games now that emulate this kind of thing, but we had to use our imaginations, aided by various chemicals, mostly alcohol. The hazards that you would encounter would include booby-trapped locks or treasure chests, etc, the usual outcome being that if you attempted to pick them you would die, probably horribly. The wife and I were in Tours recently, and there is there, a museum of Compagnonnage, which probably loosely translates as a guild of master craftsmen. And there, I was delighted to find, is an example of the real deal: a booby-trapped lock. Modern laws, at least in the UK, seem to require that you ensure that burglars are coddled while they are robbing your house, and you can't install anything which might leave as much as a scratch on their poor sensitive skins. Things didn't used to be like that. In the picture below, the little cylinder at the top of the lock is a gun that shoots you if you try to pick it. The two hinged loops of steel that form an oval at the base of the handle, spring a handcuff on you (or your corpse) if you try to turn it without having unlocked it first. I'll have five please, with the grenade and sub-machine-gun options. OK, it's just a new car, but I'm pleased with it :) And it matches the house too. From time to time, microlight aircraft fly overhead here; there's a flying club not far away, and I have had it in mind for some time to take a flight with a view to taking some pictures of Les Hallais, but also with a view to having a bit of fun. There was a bit of haze today so it wasn't ideal conditions for taking photographs, but the day was otherwise bright and sunny, and there is no time like the present. I can always come back on a clear day in Summer if I want brighter pictures. Here's a few: The aircraft - a microlight, or ULM in French. The village of St Pierre sur Erve, you can see the H-shaped chateau in the middle of the village with its formal garden. Les Hallais, a fine place for groups of people to come and stay :) and the nearby village of Saulges. Also, two views of the canyon formed by the river Erve a hundred yards or so from chez moi. This plant is a shrubby honeysuckle; it doesn't climb by twining around other plants, it just sits and grows like a shrub. It's usually described as "unusual" as a garden plant, but I don't know why; it's not commonly grown but it's easy enough. It likes good soil and sunshine. 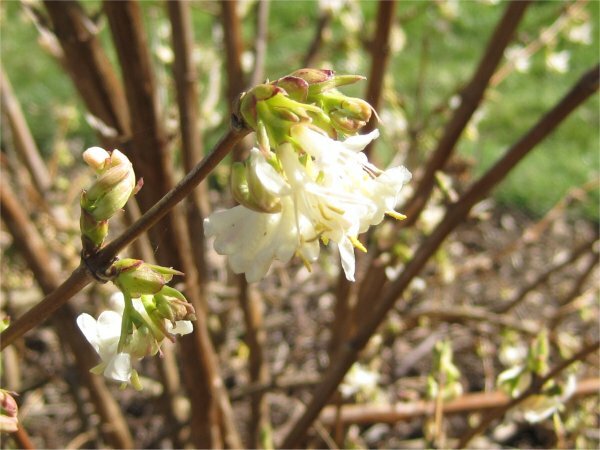 It flowers profusely in the winter months, with tiny little white flowers that are heavily scented. Very pretty, and it brings you flowers before the daffs come out.